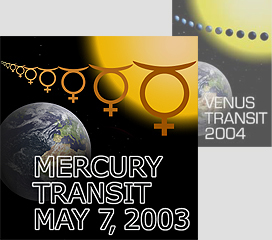 The organisers of the "Venus Transit 2004" educational programme have prepared some useful information sheets for students and teachers in connection with the transit of planet Mercury across the solar disk on May 7, 2003. They are available in different languages and formats as indicated in the table below (more to follow as the translations become available!) and may of course be copied freely. Note also the useful weblinks at the bottom of this page. You can have access to recent solar images (from ground-based telescopes and SOHO), via the dedicated webpage at the Observatoire de Paris.